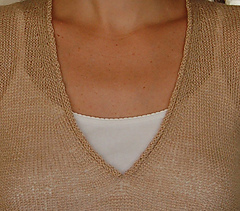 sweater with 3/4 length sleeves is worked in Stocking stitch with rolled hem, cuffs, and V-neck. The body is slightly flared towards the hem which is worked with a 10 stitch left- and right-slant increase panel down each side. Optional cap shaping at the top of the sleeves is worked with short rows, giving the shoulders a more tailored look; without short rows this pattern is easy. Light as a feather and perfect for packing; wear with chinos or shorts when a light breeze blows.